Ivar’s Birthday Bargain: $1.08 Menu Items Served up on March 19; plus free cake pops for the first 108 guests. 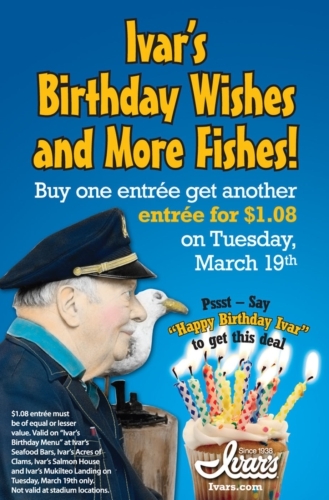 As part of Ivar’s annual birthday festivities, throughout the day guests can purchase one full-priced entree and receive a second entree from a special birthday menu for just $1.08, simply by exclaiming “Happy Birthday, Ivar” when placing the order. In addition to the birthday discounts, Ivar’s will also treat the first 108 guests at each of its locations to a delicious blueberry birthday cake pop, one of Haglund’s favorite flavors. To add to the festivities, Ivar’s is also hosting a two-week “Ivar Haglund Birthday Video and Photo Contest” (March 6-20) on its Facebook page. Fans can enter by uploading a creative video or photo wishing happy birthday to Haglund, for a chance to net a $108 Ivar’s gift card or other great prizes. Winners will be selected based on originality and creativity by a panel of Ivar’s judges. Enter at www.facebook.com/IvarsRestaurants by March 20. Ivar Haglund began the popular restaurant chain bearing his name in 1938, when he opened a fish and chips stand at his Seattle aquarium, which was located on the Waterfront at Pier 3 (now Pier 54). He was well known for his popular radio ditties, as well as his comical stunts such as clam eating contests, taking advantage of a train-car syrup spill, and an Ivar’s clam postage stamp. He passed away in 1985 just shy of his 80th birthday. The history behind Ivar Haglund can be found on Ivar’s website. This year also marks a significant milestone, as it’s the company’s 75th anniversary, with more details revealed later this spring. The birthday bargain is available all day long at any of the 23 Ivar’s Seafood Bars throughout the state, excluding stadium locations. All Ivar’s full service locations are also in on the action, including Ivar’s Acres of Clams on Seattle’s waterfront, Ivar’s Salmon House on north Lake Union, and Ivar’s Mukilteo Landing overlooking Possession Sound. Ivar’s Seafood Restaurants began on Seattle’s waterfront in 1938. Today, there are 23 Ivar’s fast casual Seafood Bars and three full-service restaurants: Ivar’s Acres of Clams, Ivar’s Salmon House and Ivar’s Mukilteo Landing. Ivar’s Seafood, Soup and Sauce Company markets and sells its award-winning soups, chowders and sauces both nationally and internationally. The company also operates regional stadium concessions including Safeco Field, CenturyLink Field, KeyArena, Bank of America Arena, Husky Stadium and Cheney Stadium. Learn more at http://www.ivars.com/. This entry was posted in News and tagged Ivar Haglund, Ivars, Restaurant by admin. Bookmark the permalink.